When two hounds square off, it’s usually the most tenacious tail-wagger that comes out on top. 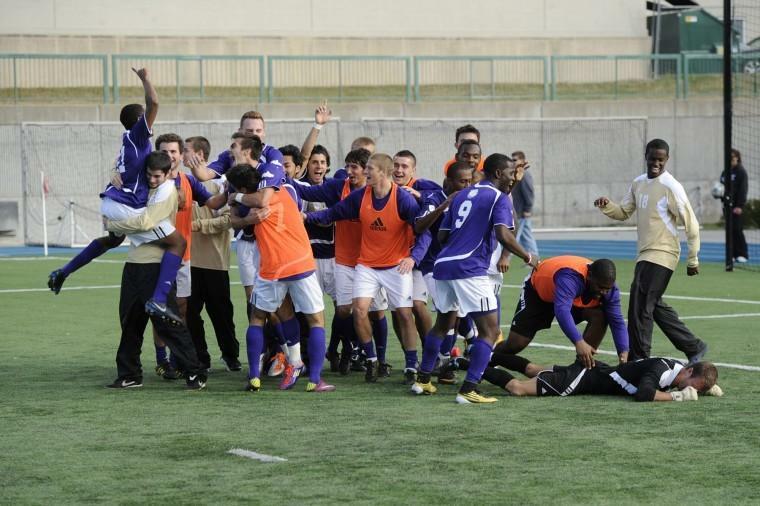 Charlie Bales, Andy Ryan and the rest of the Western Illinois men’s soccer team know that dogging it won’t do if they hope to fetch the first NCAA tournament victory in school history for veteran Leathernecks coach Eric Johnson. It will be Col. Rock III vs. Victor E. Huskie, English bulldog vs. Alaskan huskie, and Leathernecks vs. Huskies when Western (13-6-1) takes on Northern Illinois (14-5) Thursday at 1 p.m. at the Northern Illinois Soccer and Track & Field Complex in the first round of the 2011 NCAA Division I Men’s Soccer Championship. Johnson, who has now taken a Leathernecks team to the NCAA tournament five out of the past eight years, said he expects Western’s cross-state rival to doggedly defend their home turf. “It’s a great matchup,” said Johnson, who was voted Summit League Coach of the Year for the fourth time in his Western career after leading the Leathernecks to the 2011 regular-season conference title. “We know (the Huskies) from (playing them in the) spring … (they’re) a good in-state rival. Northern coach Eric Luzzi, meanwhile, said he also expects a real dogfight on Thursday. “Western is a good team; they won 13 games this year,” said Luzzi, who is in his third year at the Huskies’ helm. “I know coach (Eric) Johnson very well. He is an outstanding coach and he will have his guys ready. On paper, Western and Northern would seem to be evenly matched. Northern, which earned an automatic bid to the NCAA Tournament by defeating Western Michigan 1-0 on Sunday to claim the Mid-American Conference postseason title, has a balanced scoring attack, just as the Leathernecks do. Ten different Huskies have dented the net at least once this fall, paced by sophomore forward James Stevenson (6 goals, 2 assists), a native of Falkirk, Scotland. Meanwhile, the Leathernecks have gotten goals this season from 13 different players, with junior forward Nathan Bruinsma (5 goals, 2 assists) and senior midfielder Daniel Lewis (5 goals, 1 assist) the leading scorers. Huskies junior goalkeeper Jordan Godsey has compiled a sparkling 0.62 goals-against average to go with 56 saves and 11 shutouts. Western senior Ryan led all Summit League goalkeepers this season in goals-against average (0.88), saves (90) and save percentage (.841). Ryan’s veteran leadership, along with the stalwart back-line play of Summit League Defensive Player of the Year Bales and fellow fullbacks Torrance Brown, Kooten Johnson, Hilary Esangbedo, Adrian Loyocano, Ebenezer Mengistu and Aaron Winkelmann, have kept the Leathernecks in every game this fall. Western has only surrendered 18 goals in 20 games this season. If Ryan, Bales and company can manage to be just as stingy on Thursday, and if offensive playmakers like Bruinsma, Lewis, Alexis Dominguez, Husref Jupic, Diego Gonzalez and Mariano Leo can keep the pressure on Northern’s defense, the Leathernecks could earn themselves a second-round meeting with the No. 2-ranked team in the nation, Creighton (18-2). The game would be played at 1 p.m. Sunday on the Bluejays’ home turf of Michael G. Morrison, S.J. Stadium in Omaha, Neb. For the Western coach, Thursday’s game provides one more opportunity to coach his son, Kooten, who will be graduating this year. “Most dads who have children that love sports get to coach them when they are very young,” the Leathernecks coach said. “Few get to interact with them through sport at the Division I level, so I am really fortunate.